Margaret Mary Alacoque entered the Visitation Convent in 1671 and six years later Christ appeared to her in a vision in which "I could plainly see His heart, pierced and bleeding, yet there were flames, too, coming from it and a crown of thorns around it. He told me to behold His heart which so loved humanity. Then He seemed to take my very heart from me and place it there in His heart. In return He gave me back part of His flaming heart. "In all, there were four revelations, the last of which is responsible for the nine First Fridays' devotion. Also requested by the Sacred Heart was the establishment of a feast in His honor. 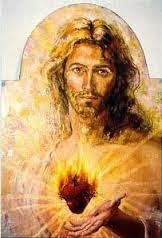 We now celebrate this Feast of Sacred Heart on the first Friday after the octave of the Solemnity of the Body and Blood of Christ, in addition to honoring the Sacred Heart every first Friday of the month.